The European tuna fleet planted the first batch of experimental BIOFADs last week in the Indian Ocean. The project plans to deploy 1,000 drifting Fish Aggregating Devices (DFADs) built with biodegradable materials in the Indian Ocean during 2018-2019. The joint initiative is being carried out by AZTI, the Spanish Institute of Oceanography (IEO), the French National Research Institute for Sustainable Development (IRD), the Seychelles Fishing Authority (SFA) and the International Seafood Sustainability Foundation (ISSF), together with the collaboration of tuna freezer vessels committed to sustainable fishing and members of the ANABAC, OPAGAC and ORTHONGEL associations. (Pasaia, 22 May 2018) The European BIOFAD project coordinated by AZTI was launched in August 2017 and will run until May 2019, testing the use of natural biodegradable materials such as cotton and bamboo to build BIOFADs (Biodegradable and non-entangling Fish Aggregating Devices) with the aim of finding solutions that minimise negative impacts of these devices on marine ecosystems. ´We are investigating the use of non-entangling FADs built with natural biodegradable materials which allow fishing to be carried out in a more sustainable way, minimising the impacts on the ecosystem and preventing sensitive species such as sharks and turtles from being entangled.´ Hilario Murua, Sustainable Fisheries Management, AZTI. FADs are currently built to prevent entanglement but are still using synthetic materials such as nylon mesh. The long life cycles of such synthetic materials increase the potential negative effects of FADs on the marine environment, such as stranding (i.e., FAD beaching) in sensitive areas like beaches and reefs. These artificial material FADs accumulate over time, becoming a growing problem in marine ecosystems. The aim therefore is to design and test new non-entangling FAD prototypes that are effective for fishing, but biodegradable and non-contaminating for the marine environment at the same time, preventing all kinds of species from being entangled, particularly sensitive species such as turtles and sharks. The main challenge of the project is to study the efficiency of BIOFADs and the biodegradable materials used, and to compare them with non-entangling synthetic FADs currently used by the fleet. This data, together with a study on the economic impact associated with introducing natural and biodegradable materials to the tuna purse seine industry, will enable the Consortium led by AZTI to propose specific BIOFAD prototypes using optimum biodegradable materials. The use of various specific designs and biodegradable materials to build non-entangling drifting FADs under actual sea conditions. Identification of options to mitigate the impacts of drifting FADs on the ecosystem. Assessment of the socio-economic viability of using BIOFADs in purse seine tropical tuna fisheries. 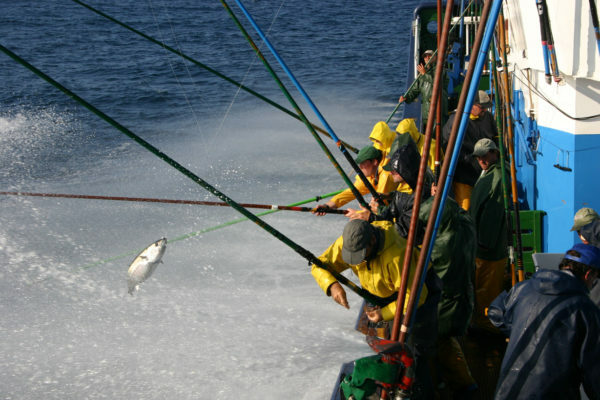 The ultimate goal is to significantly reduce the amount of synthetic materials used to build FADs, and prevent the accumulation of FADs in the marine environment, maintaining a balance between the tuna aggregative capability, durability and safety of such devices and preventing negative impacts on the ecosystem. This project is part of the line of work that the Technological Centre AZTI has developed in collaboration with the European tropical tuna purse seine sector to minimise potential negative impacts of fishing activities. The collaboration between industry and science is essential to ensure the long-term sustainability of natural resources by using the best operational and management practices based on the best scientific knowledge. In this respect, the BIOFAD project aims to make progress in the search for joint industry and scientific measures that reduce the negative effects related to the use of FADs.